said John Hammersley, co-founder and CEO of Overleaf. As part of a philosophy of “ship early, ship often”, Overleaf introduced a beta version of the new Overleaf in May 2018. During the summer, a wealth of helpful feedback on the new platform’s functionality was provided by users, which has driven further development leading up to this month’s launch. Addressing popular demand, the new Overleaf platform has been developed to offer a wide range of capabilities to support authors working both online and offline. Real-time track changes and commenting – simplifying review, acceptance or rejection of text edits for faster and easier collaborative editing. Private invitation, link sharing and chat functionality – facilitating new and more productive collaborations. 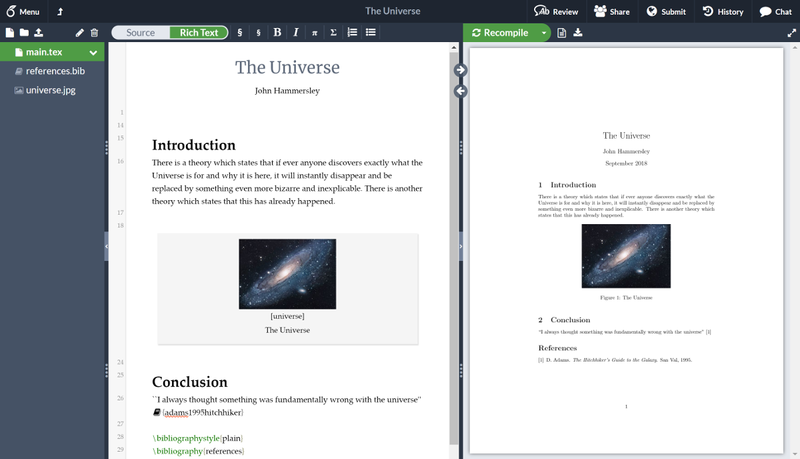 Auto-compiling and real-time preview – updating the PDF view so collaborators can focus on their writing. Complementary Rich Text and LaTeX modes – flexing to a user’s preference for editing projects with/without working in the code. Ability to import and sync external files (e.g. datasets, bibliographies) – integrating with resources from other projects or external sources. Direct submission to journals and repositories – saving time and effort when submitting manuscripts. Advanced reference search – facilitating simple search by author name, title, publisher, year or keyword for effortless and fast insertion of the correct citations. Automatic two-way Dropbox/Github sync – supporting seamless transition between working offline to working online with other collaborators. "I am really grateful for Overleaf. It has enabled a slew of research and teaching development in my work that would have been annoyingly difficult before. 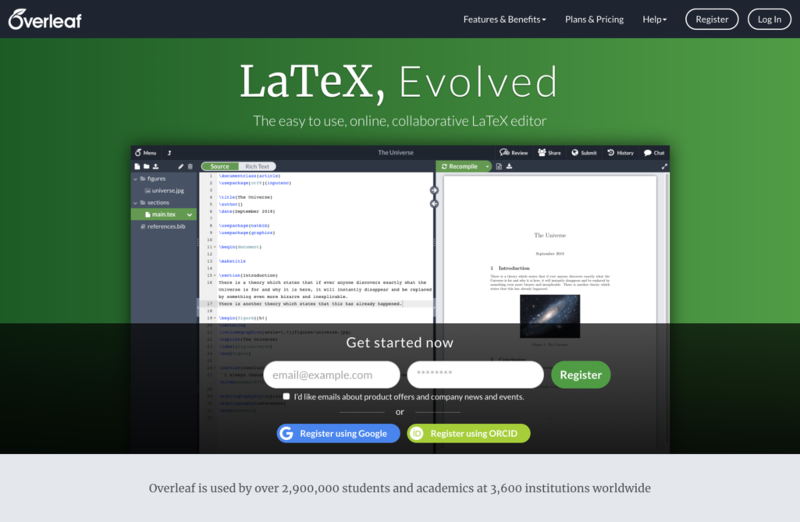 Even people who don’t know LaTeX are participating with me on research proposals." Similar benefits have been enjoyed by universities when processing student thesis submissions. At Purdue University, where a growing number (35%) of all STEM students now use the Purdue thesis template on Overleaf, workload and review times decreased in cases where students used Overleaf to write a thesis – falling from 5 or more graduate staff/student meetings per thesis to approximately 2–3 meetings per thesis. It is estimated that this removes the need for approximately a thousand meetings each year at this single institution. said Daniel Hook, CEO, Digital Science. By the end of the year, the new platform will enable direct Git access to projects, Zotero bibliography imports and additional publisher submission links, as well as an upgrade to Overleaf’s on-premise offering to include the new platform features. Overleaf was founded in 2012 by two mathematicians who built a light-weight collaboration system and used it for writing research papers. It was simple and intuitive to use – all you needed was a web browser. This intuitive online platform has since seen rapid adoption across science and research, and Overleaf's award-winning collaboration technology is now in use by over 2.9 million researchers, students and technical writers in institutions, labs and industry worldwide. Part of Digital Science, and working in collaboration with international publishers and organizations, Overleaf is helping to make science and research faster, more open and more transparent by bringing the whole scientific writing process into one connected place in the cloud - from idea, to writing, to review, to publication. In mid-2017 Overleaf acquired its nearest competitor ShareLaTeX, and our expanded team worked together to build an even stronger next-generation platform. Visit www.overleaf.com or follow us on Twitter @overleaf. Digital Science is a technology company working to make research more efficient. We invest in, nurture and support innovative businesses and technologies that make all parts of the research process more open and effective. Our portfolio includes admired brands including Altmetric, Dimensions, Figshare, ReadCube, Symplectic, IFI Claims, GRID, Overleaf, Labguru, BioRAFT, PeerWith, TetraScience and Transcriptic. We believe that together, we can help researchers make a difference. Visit www.digital-science.com or follow us on Twitter @digitalsci.